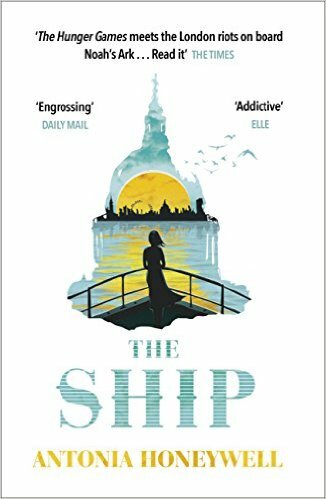 Soon after she’d signed the publication deal for her first novel, The Ship, Antonia Honeywell realised the people around her had other preoccupations. She had four small children, and in the lead up to Christmas, they were more interested in turkey, mince pies and what was under the Christmas tree than the imminent publication of their mother’s book. Other debut authors were tweeting about writing residencies they’d been offered, but such opportunities were out of the reach of a forty-something mother. Is anyone else out there publishing their debut novel over the age of 40? I'll be debut-ing at 43. Let's meet and drink champagne in celebratory protest. That was the start of a string of responses. Before long, Honeywell was compiling a growing list of debut authors over the age of 40, all eager for someone to share their experience with. And that first champagne meet up happened only a few weeks later, in Browns in Covent Garden. Thus were The Prime Writers born. That was in January 2015. The original group of 35 authors at that first meet up has now expanded to over 60. The group is specifically for trade published authors who brought out their debut novel over the age of 40. The restriction to trade publishing does not arise out of snobbery, but because the issues that dominate their writing lives do tend to be different to those facing self-published authors. “It’s about finding your tribe. Writing can be very lonely. Publication isn’t a set route, and no two authors have the same post-publication story. We have different support networks – someone might have a brilliant agent, or an editor, or a writing group they rely on. As with any community like this, sustaining it takes a huge amount of work. Three of the group, Clare Fuller, Vanessa Lafaye and Sarah Jasmon, set up their website, with its closed discussion forum. And the group have a rota for curating material on the website and managing their Twitter feed, @ThePrimeWriters. 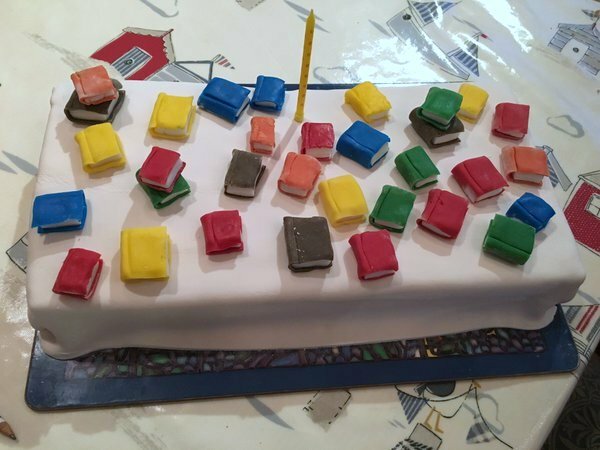 The Prime Writers have recently had a first anniversary lunch (with cake) after which they held a meeting to decide what direction they wanted to group to take. And there is plenty on the horizon. Some of the group will be taking part in the Hillingdon Literary Festival in October. And nine of the authors are going away together on a writing retreat later in the year. 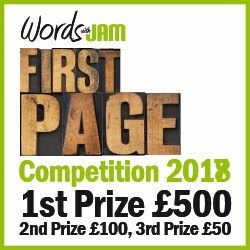 Two other festivals have approached the group, and discussions are afoot about how best to share their wealth of experience and expertise with their biggest audience – aspiring writers. After a period as education officer for the Natural History Museum, she became a teacher and was Head of English in a large comprehensive in a deprived area of London. 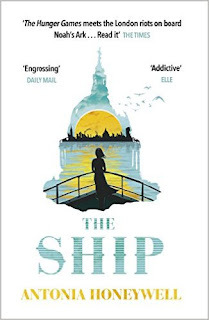 Read my review of The Ship on Book Muse UK. 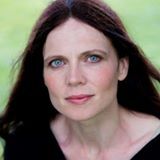 Other Prime Writers include Claire Fuller (Our Endless Numbered Days) Laline Paull (The Bees) Kate Hamer (The Girl in the Red Coat). Explore the full list here. A Creative Writing MA is a notoriously expensive investment and, in terms of distance learning, it’s also a relatively new phenomenon. 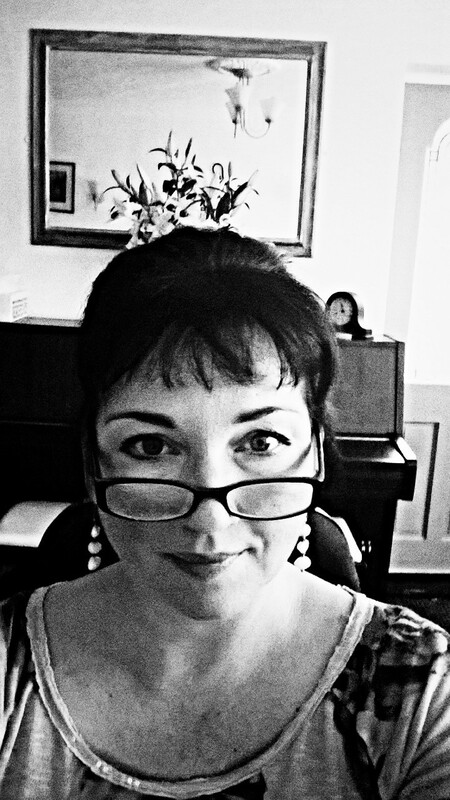 When I began mine at Lancaster in 2011, it was one of only two on-line courses available. Now, in 2016, a google search brings up so many options that they run to several pages. 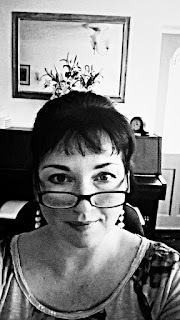 Twenty or so years ago, an agent would pick up a new writer and would be prepared to work with that writer for up to two years in order to produce a polished debut novel. Then a couple of serious recessions impacted the publishing industry, and the internet altered the nature of publishing. Publishers became more risk averse, and agents had no choice but to follow suit. Today, agents will only take on a novelist who is virtually ready to be put straight out into the public arena. 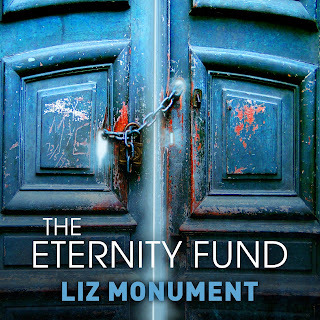 Authors still have to do their training somewhere, but the system has conspired to ensure this is at the author’s cost and not the publisher’s, both in terms of time and money. Enter the education system, sometimes with seductive promises that ‘anybody can write’ (I have known at least one well-known University use this slogan in its advertising campaign), effectively offering to sell any paying member of the public the dreamed-of chance to find themselves on the other side of a signing table. The truth is that education is now an industry, and universities are smart enough to cash in on your dreams, because like it or not, writing is just like any other job out there: not everybody can do it. My own distance learning MA experience was brilliant, and a choice I will never regret having made. I’d reached a glass ceiling in my writing where, after several novels, my enthusiasm repeatedly fell flat as they reached their final stages. I knew something wasn’t right, but I couldn’t work out what. Enrolling on the MA to sort out this dilemma wasn’t a decision I took lightly. I didn’t have the £6,000 fee, so after four years of telling myself no, you can’t do this, I finally re-mortgaged my house to find the money, and took the plunge. My biggest fear was discovering that I simply didn’t make the grade and that I’d better give up and start origami or flower arranging instead. I knew the MA was, in a way, my dreaded watershed moment. My tutors were all published novelists, poets and short story writers with a plethora of industry awards to their names. Between them, they had a huge amount of educational experience. Just because you write doesn’t mean that you can teach people to write, so both publication and teaching experience are essential for good tutors. Before I joined the course, I thought I had a handle on the basic differences between genres. I followed various literary agents and read authors’ blogs, and I had a general understanding of how the publishing industry works. It took my MA to teach me that there are many more styles of novel out there than I’d realised, and that there are good, mediocre and pretty poor examples of each on the bookshelves. With some guided reading suggestions from a tutor and a wider selection of book reviews offered by my MA cohort, the reading I amassed proved a positive influence on my prose. Nothing makes you perform like a date in the diary. Rather than winging it alone, the MA provides along-the-way critiquing which shapes your work as you go. This means that you’re constantly refining both your prose and your intentions, rather than tackling 80,000 words plus before anybody else gets to tell you what they think. 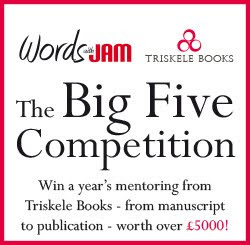 The submissions for MA prose samples vary between 1,000 words and 3,000 words. At Lancaster, these submissions go alternately to your tutor, and to your conference group. Fortunately, there are several members in each group, so any weaker links (in the form of people who either rip your work to shreds for the fun of it, or are just plain nice because they can’t be bothered to be constructive) shouldn’t ruin your experience of the course. I was lucky: both my tutor Sarah and my conference group Dee, Ericka and Olivia were amazingly supportive, and have remained firm friends. Two years of part-time study later, my MA novel Frozen was shortlisted for Mslexia’s unpublished novel competition (2013), and signed by The Viney Agency (2014). 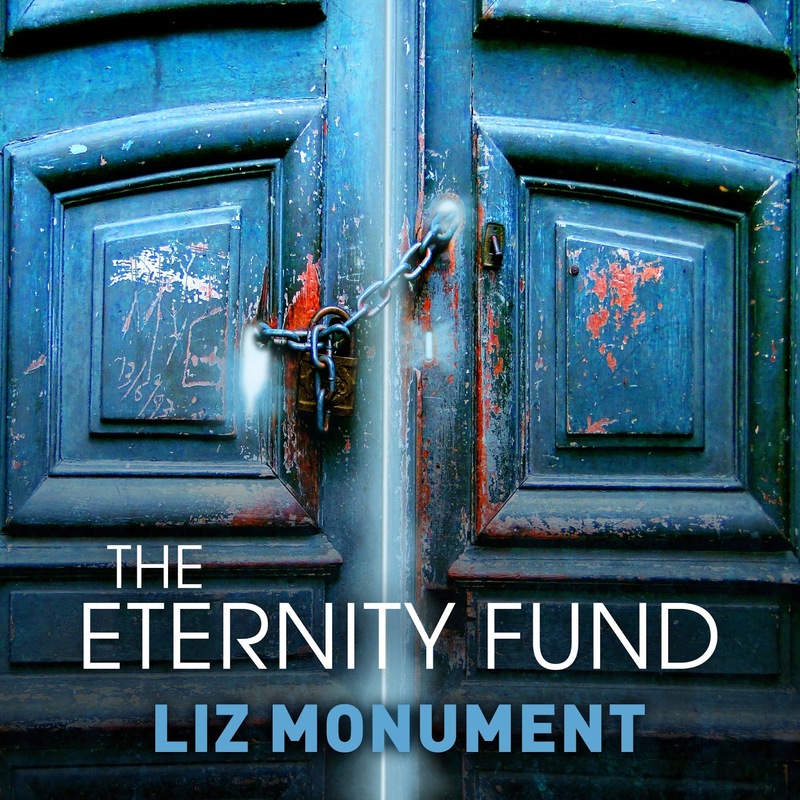 Frozen was re-named The Eternity Fund (the Disney musical Frozen saw to that!) and was subsequently published as a talking book by Audible.co.uk in 2015. If your concerns are financial, and you simply can’t afford to enrol on an MA, there are plenty of excellent short writing courses staffed by published authors who are also experienced teachers. 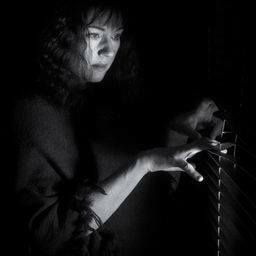 Many take place in retreats where you will have the delight of switching off daily life to focus purely on your art. Many of you who have your paperback books printed by the Ingram Content Group – whether through Lightning Source or Ingram Spark – might be surprised to realise that on any given day your book might be printed alongside a best seller from Penguin Random House, an academic text book from Oxford University Press, or even an indie published book from Amazon’s Createspace! 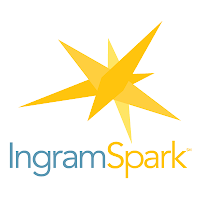 The family-owned firm, Ingram, which started in Tennessee, is now the major provider of Print on Demand services in the UK, US, Australia, France, and through its various Global Connect Partners, in many other parts of the world too. Italy is coming on stream soon, then India. South Africa is over the horizon. Ingram currently boasts 39,000 retail partners around the world, and that is growing constantly. I was privileged, just before Easter this year, to have a chance to view the printing process for myself, at their UK base in Milton Keynes. I wasn’t allowed to take photographs (apparently there have been some suspected cases of industrial espionage in the past) but Ingram have kindly provided some stock photos to give you a flavour of the process. The whole operation takes place in a large, brightly lit warehouse-like building. For the amount of heavy machinery they use, it is surprisingly quiet. It’s also temperature and humidity controlled. On the day we were there, the atmosphere was quite dry; so, high in the rafters, we could see jets of steam being sprayed into the air. 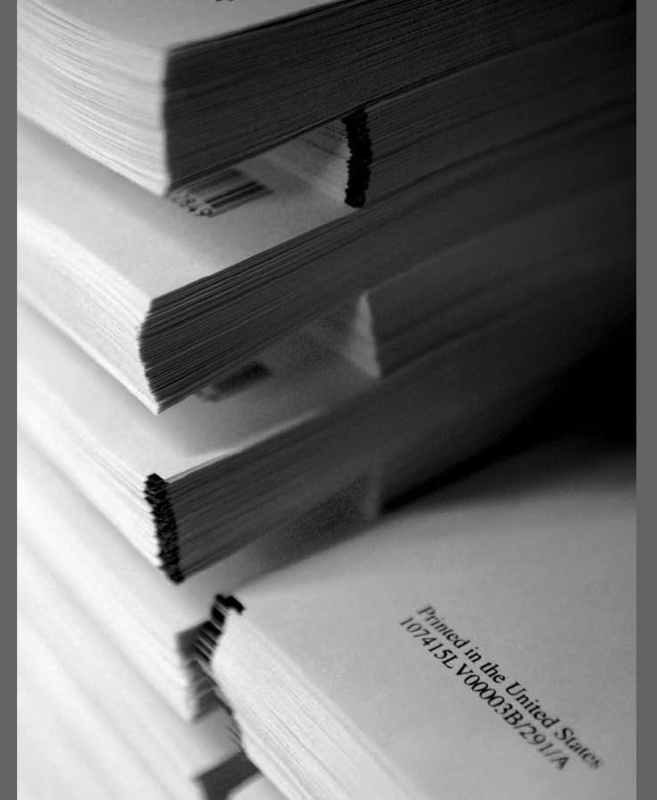 From all the orders that have been received, they ‘draw down’ approximately ten thousand pages at a time, of books that are to be printed on the same type of paper (either cream or white). This might represent ‘n’ copies of one book, or one copy each of ‘n’ different books – or more often a mixture of many different books and many different sizes of print run. That set of books is then sorted by size, to minimise the number of times the machines have to adjust themselves. 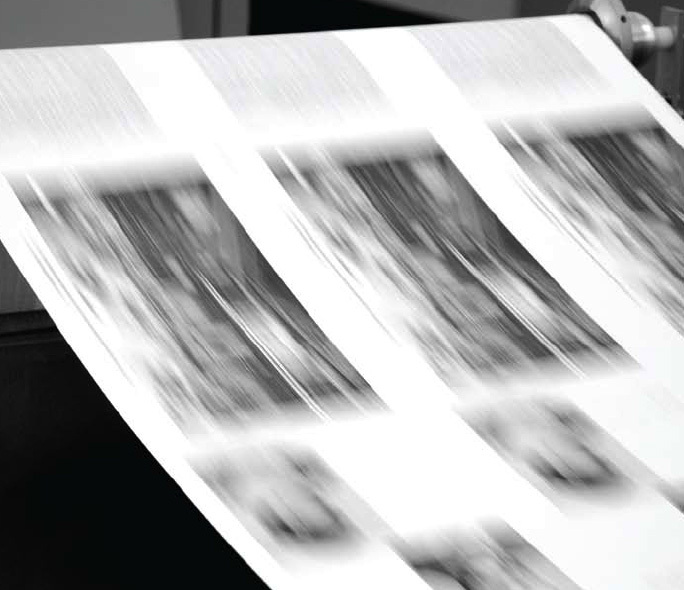 Covers and interiors are printed on different machines, but in parallel and in the same sequence. Three main types of printers are currently in use. Printers using gel inks are used for all covers, as well as for premium quality coloured interiors. Then there are the toner-based printers, once used for most of the standard interiors. These, however, are gradually being phased out and replaced with newer ink jet printers, which can now match them for quality. The old toner based printers needed to heat the paper up in order to set the ink and then cool it again. Not only did this expend a lot of energy, but it also meant that the paper would shrink, as it dried out with the heat, then expand again, sometimes causing it to warp. The newer printers are thus both faster and more energy efficient. It is amazing to see the half-ton rolls of paper being fed into the presses, which print continuously without pausing to take breath. Systems of rollers take up the slack and feed it out again, to allow for any changes of speed. One machine prints one side, before the paper is fed seamlessly into another to print the other side. 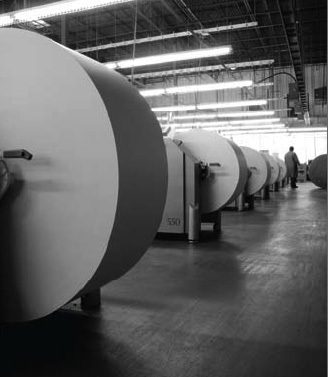 Pages are printed either two or three abreast, depending on the size of the final book, and a machine called a plough folds the pages as they pass through, ready for cutting. Out of this sequence of machines come stacks of pages forming each book’s interior. At the binding machine, these are matched up with the corresponding printed and laminated covers, using bar codes. If the bar code on the interior doesn’t match the bar code on the cover, the binding machine will simply refuse to proceed! If all is well, though, the machine cuts the pages (thus removing all the codes and markers using in the process) then folds and glues the cover to the interior. A separate process, requiring slightly more manual intervention, produces the ‘case bindings’ for hardback books. It’s a system that never stops. They operate a day and a night shift, and print thousands of books a day. Already, the whole process works with surprisingly little human interaction, but that is set to be reduced even further, as robot technology from Germany is introduced. Next time I place an order for one of my books with Ingram, I’ll picture it on its journey through that warehouse, from digital file to great rolls of paper, unfurling, printing, folding, stacking, then cut, glued and bound, and finally boxed, labelled and packaged – all in the matter of a few hours. 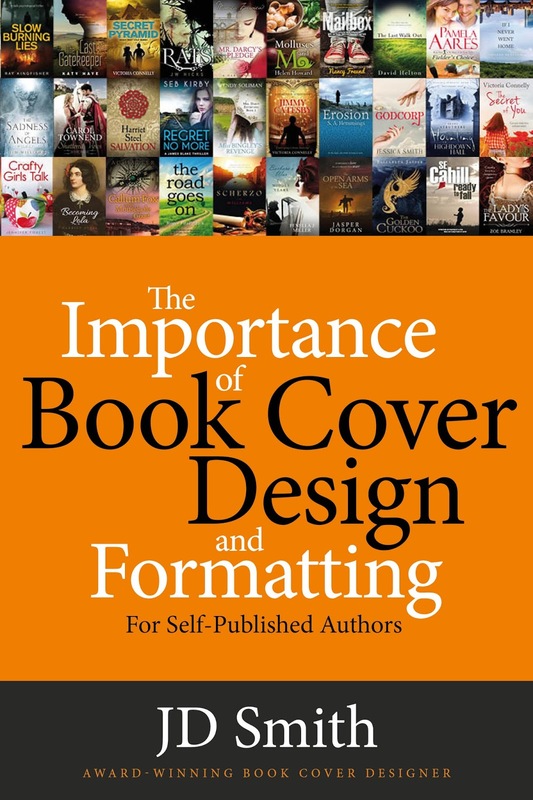 I've covered various topics on the subject of book cover design over the years, from How to Sell More Books with Great Book Cover Design, to giving talks on the design process. What follows are a series of case studies by authors who I have had the great pleasure to work with on their books, to give an insight and flavour into the relationship between author and designer from a writers' point of view. Of the five titles by Rohan Quine so far, The Imagination Thief was the first to be published, by EC1 Digital and the Firsty Group. Its cover was designed by Andi Rivers at Firsty. 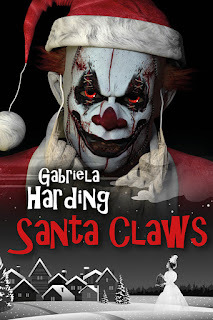 The novel is essentially literary fiction, but with a touch of magical realism and a dusting of horror; and since the secret of how to market even “pure” literary fiction has always been more elusive than most secrets, it was decided the cover should tend more in the direction of the novel’s magical realism and horror credentials instead. When I contacted Jane I had no idea what to expect. I thought Jane was some sort of a magician and that it would be dead easy to make something that will stand the test of time, or maybe even outlive me. I was right, in a way. Jane was a magician - but even a design god needs to know what is the exact wish they are expected to fulfil. I was in trouble. I was a writer, not a designer. As I flicked through the images Jane sent me, I started having cold sweats, already suspecting that I was as wrong about cover designing being easy as I was about book writing being a walk in the park. Writing is hard, editing is harder, marketing while competing with so many good books, a team of sharp warrior publishers behind them, gives you a real taste of the big bad D. You taste blood, but you carry on. And the cover is the first thing you have - the one thing people see even before reading the blurb. Unknown to me, I would find the cover design the most difficult part of writing and producing a book. That's where Jane's role was crucial. I've lost count of the many combinations we tried. We put pictures together, and they made sense, but they just weren't MY BOOK. I started to get a little taste of the agony writers experience when the cover is being done for them by traditional publishers ( something my traditionally published friends complain about, not having a say about the cover). The agony, but also the relief. They didn't have to feel like attempting a million combinations to a stubborn safe. When Jane produced the image that would become my cover, I knew straight away it was 'the one.' And having gone through the labour of choosing got me closer to my book. It was the magic touch that changed a manuscript into a real book. Taking her advice for once, I had been doing this for about 2 years, on and off, before I even realised that I might just finish it. Up to this point, I didn’t even have a title or a cover and the prose was in a very rough, unedited format on my word processor. Having never published anything before, I didn’t know what to do and always considered publishing a book to be an expensive luxury. I simply didn’t have thousands of pounds to waste on the vain publication of my ramblings. 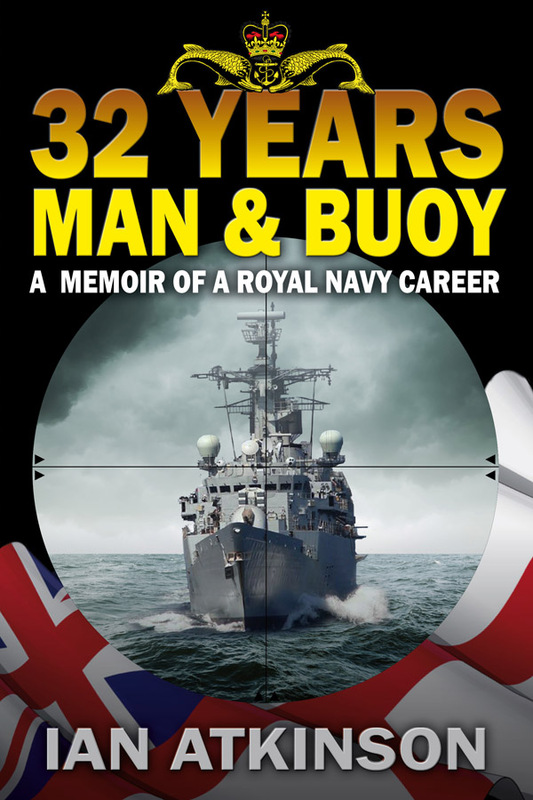 A chance e-mail from indie author Cathy Kirby to the Submariner’s Association wishing to research life on board a submarine was the key to the advice and the assistance that would finally see my work in print. It also served to give me a richly deserved kick in the pants and reignited my motivation to get it finished. Cathy belonged to an on-line forum of writers who freely offered advice, support and recommendation on the writing, publication and advertising of the finished work. Amongst others, she pointed me in the direction of Editor, John Hudspith and the talented and very lovely cover designer, Jane Dixon-Smith. After some thought, I had a cover idea formulating in my head. The title was still a work in progress, but I wanted to convey that the content covered my service on both ships and submarines. I am also intensely proud of the submariner’s ‘Dolphins’ and also the White Ensign. This seemed a tall order to include all of this and well outside of my skill set. An e-mail to Jane followed by a phone call, trying to convey my ideas, set the ball in motion. Jane then asked for some decent quality images that she could try to work her wizardry with. The first draft was always going to be a starting point as I couldn’t actually see what I wanted in my mind. I knew I wanted colour, it to look eye-catching and to really convey the contents. I pointed Jane in the direction of a list of already published covers to gain an idea of the sort of thing I was looking for. This prompted an exchange of e-mails between us over the coming weeks with me providing honest feedback and Jane trying her hardest to interpret my vague description and turn it into art. I am sure Jane was getting fed up with me nit-picking in the end, but maintained cheerful and helpful. It was as if she really cared about the cover as much as I did. Perhaps she did, after all, it would become an advertisement for her work after it had been published. Finally, the front cover was everything and more than I could have hoped for. All of my wishes for images had been encompassed. Some of my suggestions, were tried, but they didn’t look right, on reflection, so Jane tried something else. This email exchange continued until I was delighted with the result. Now I needed the back cover, as the book was intended as paperback. I fudged together a blurb (yes, that’s really what it’s called) and allowed John, the Editor, to tinker with it slightly and then it was a simple matter for Jane to format it into the back cover design. I can’t remember whose idea it was to incorporate a photograph of young me, but I like it and the finished cover and the ramblings within are something that I will always be proud of. 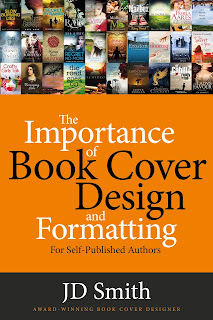 The Importance of Book Cover Design is available on Amazon.